1) It follows the original GDS3 challenges. You can find the original challenges HERE! 2) You only need to design half the cards compared to the original rules (usually going from 8-10 to 4-5 cards). I adapted the rules accordingly. 3) A little twist has been added to each challenge so people who followed the GDS3 can't come too prepared. 4) No elimination, you can skip any round or jump in at any moment. You can find the rules of the original challenge HERE, and additional rules information HERE! 1) You must design 5 cards. 2) All the cards will be two-color and each color must appear exactly twice. 3) Design one card of each of the following card types: creature, enchantment, instant, sorcery, and planeswalker. 4) The following card types cannot share the same color: planeswalker and creature, instant and sorcery. 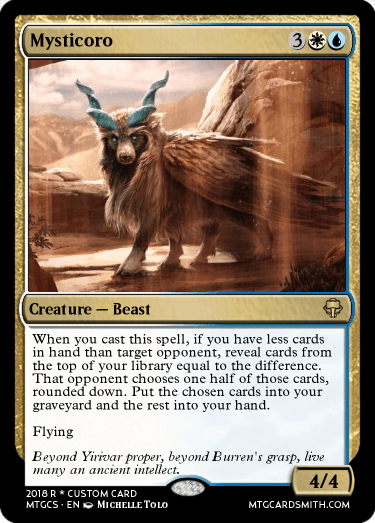 For instance, if you design a white/blue planeswalker card, your creature card cannot be either white or blue. 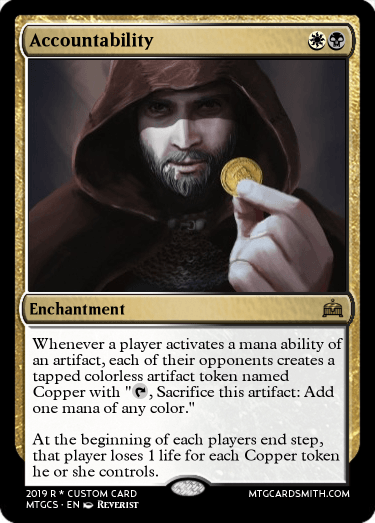 5) Each rarity must be represented at least once (common, uncommon, rare, mythic rare). 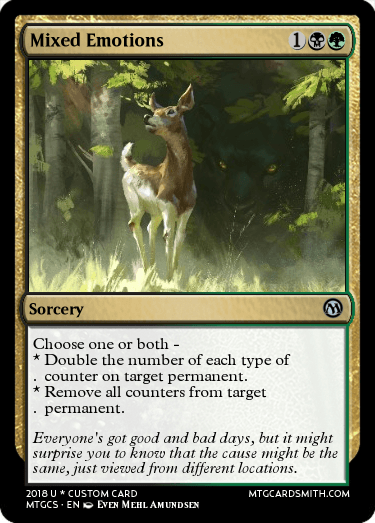 6) You are allowed access to all evergreen keywords and deciduous mechanics (hybrid, double-faced cards, split cards, etc.). Please do not create any new named keyword mechanics and do not use old block keyword/ability word mechanics. 7) Submit your cards in order of quality of design from what you consider your best design (first) to what you consider your worst design (last). But that's not all. To prevent people who already did the full original challenge from having too much of a head start, I added... a twist. 7) Each cardsmith who wants to participate will receive A RANDOM SET OF FIVE TWO-COLOURS COMBINATION. To know which colour combinations you have to design, take the first letter of your username on this forum and look at the table below. For instance, my username is ningyounk, I look at the letter N, I would have to design the following five cards: WU - UB - BG - RG - RW. Now remember, this challenge is all about digging up your best designs in a vacuum and twisting them to fit all those restrictions ;) Last little tip to you all: instead of a grid, I highly recommend putting your colours in a cycle to know which slots are still available to which card types as you fill in the connections between the colours. Wow this looks awesome! Are old cards allowed? Also, are hybrid, split cards, or transform cards allowed like the original challenge? Old cards are allowed as long as they fit within the restrictions. Deciduous mechanics like hybrid mana, split cards and double-faced cards are allowed, like in the original challenge. Light of the tree is too high costing in my opinion. Dark Ritual does the same thing at the same rarity for one mana and no downsides. Three of my favourite colour combinations in here? I guess the universe just knew, lol. Me too! i got rakdos, dimir, boros, simic, and selesnya! count me in! 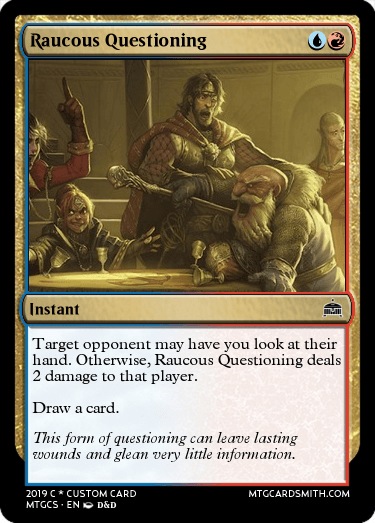 The fact that the Sorcery is color-restricted in regard to both Instants and Enchantments means that as soon as you've picked it, you have to choose between two of the remaining four options for both of those other card types. This tripped me up once already because I'd chosen a creature that took one of those options without realizing it. I'd actually prefer if this ambiguous restriction were removed. You could even leave the Planeswalker/Creature Instant/Sorcery color-restriction in place. Also, just to clarify, there is no thematic restriction and no bonus to having cards that are related, correct? They are each judged on their own merit and essentially "in a vacuum?" The original contest has very specific formatting instructions for the designed cards. Would you like us to follow those formatting instructions instead of posting the cards, or in addition to posting the cards? Following some feedback, I have REMOVED the following rules: "Your sorcery card and enchantment card cannot share the same colour." This should double the possible combinations of card types and colour pair. 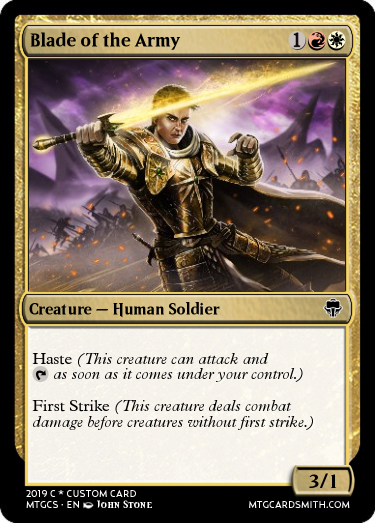 Since this is an MTGCardsmith contest, we're using mock-up cards using the website so you don't need to post the text of your card as long as you post the image or the link of it ^^ That being said, you are allowed to do so if you like, it's just not mandatory. Tried to make another efficient creature like Skyline Legionnaire. Literally Essence Scatter / Murder. Overcosted for either on their own, seems right for the choice. -2: Return a permanent card from your graveyard to your hand. -5: You get an emblem with "Whenever a permanent card enters your graveyard from anywhere, return it to your hand at the beginning of the next end step." Sorta forced into this color of planeswalker, but wanted to do something different about these colors. 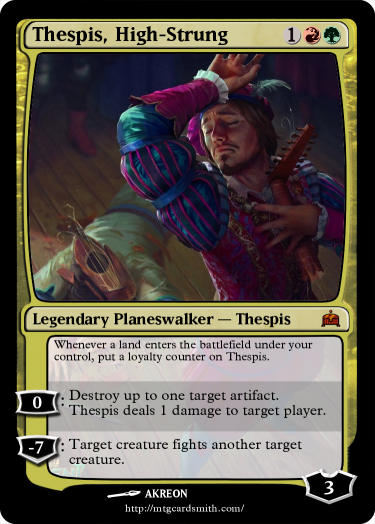 Since their both utilize the graveyard, why not make a planeswalker about it? +2 is clearly black, -2 is clearly green, and the emblem is sorta both (maybe?). The next end step clause is to prevent people from comboing too much. Also gives a window for opponents to interact. Whenever you cast a spell, put the top card of your library into your graveyard, then exile the top card of your library. If they share a card type and the exiled card has a lesser converted mana cost, you may cast it without paying its mana cost. Two target creatures you control gain protection from everything but each other until end of turn. Worked from image to card. Tried to capture feeling of a couple embracing(?) each other and are stronger together. Of course, they are absolutely okay with each other affecting themselves (positively). Also cheap card to force some damage through. @ningyounk: oh it's first letter of our username? I thought it was first letter of our actual names, haha! Sorry about that! @ningyounk: haha, fair enough! No, neither Kalam nor Mekhar are part of my real name; Kalam Mekhar is a character from a fantasy novel series. So, basically what i would have to do is make a different card type for each of my color combinations, and make them each a different rarity? Is the creation of nonexistent tokens permissible? I'm speaking for @ningyounk here, but only because I'm sure that he'd concur. Feel free to enter! Just replace an actual card image entry with the format used on the actual WotC GDS Challenges for your Planeswalker entry. You may play CARDNAME's loyalty abilities twice each turn instead of once. +1: Create a 3/2 black Horror creature token. -3: This turn, whenever a Horror enters the battlefield under your control, you may return target creature to its owner's hand. -13: You get an emblem with "Whenever a Horror enters the battlefield under your control, return target permanent to its owner's hand. That player discards a card." Because of the limitations of the Planewalker cardmaker here on the site, this might prove a better option for CPUs as well. If you create a text-only card, please link an illustration that would go with it, so it's easier to compare your cards with other cardsmiths, as finding the right illustration is an additional challenge on this website compared to the original challenge. Can I make my cards on another card creator such as MTG.design or magic set editor? I don't have time to make it look fancy. Note that the last card I used in the other challenge but I tweaked it to bump it from uncommon to rare.